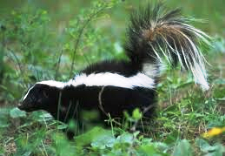 Independent Animal Control, which provides animal control services to Cherry Hill Township, recommends that homeowners take the following steps to deter skunks and other nuisance wildlife from their properties. *Please note that while Animal Control does not trap or retrieve wildlife from private property, our Animal Control Officer will respond if an animal is displaying symptoms of rabies. To report a suspected rabid animal, call (856) 718-0305. -- Symptoms include limb paralysis, circling, boldness/unprovoked aggression, disorientation or staggering, foaming at the mouth, and uncharacteristic tameness. -- Note that even though skunks are mostly active at night, they sometimes look for food by day—particularly in the spring, when they have young and may be extra hungry. Don’t be concerned if you see an adult skunk in the daytime unless she is also showing abnormal behaviors. Remove the Skunks' Food and Shelter Sources • Remove nuts, berries, and other natural food sources. Skunks are scavengers, so they'll eat anything nutritious they can find. If you have trees that produce nuts, berries, crabapples, or other fruits, clean them up by raking your yard as often as necessary. • If you keep an outdoor pet such as a dog or cat, be sure to pick up any food or water. Again, skunks are scavengers and will eat anything they can find. • Other vegetation, like piles of grass clippings, should also be discarded, since it may contain seeds or other sources of food for skunks. • If you have a garden, harvest ripe fruit and vegetables as soon as you can, to prevent a hungry skunk from feasting on them. • Use a tray under your bird feeder to catch most of the seeds, and clean up stray seeds dropped by birds often. Protect Your Waste • Much like raccoons and other stray animals, skunks can survive on garbage alone. It's important to keep your trash cans properly sealed. Sometimes regular garbage cans simply won't do. To defend against scavenging animals, you can buy locking garbage cans at a fairly cheap price at your local home improvement store. • If possible, store your trash bins in a shed or in your garage at night, so their smell doesn't attract skunks. • Use an enclosed compost bin, since skunks like to eat old fruit and vegetable peels, eggshells, and other items that you may be composting. Close Off Hiding Places • Skunks like to make their homes under decks, porches, and in other sheltered areas. Close off spaces that may be appealing to skunks using rocks, fencing, or plywood. • Log piles and piles of lumber or building materials can serve as shelters for skunks. Store the materials in a shed or bin to prevent skunks from moving in. Employ Deterrents to Keep Skunks Away • Install lights in your yard. Skunks are nocturnal, and they shy away from bright lights. If you light your yard at night it will be a lot less appealing to skunks. However, you risk attracting insects that like bright light, such as crickets and moths. • Since the lights will be shining all night long, consider using solar lighting or energy-saving lighting to avoid paying high electrical bills. • You could also install a motion sensor that gets tripped when a skunk or another creature comes close. In this case, the skunk will have to enter your property for the light to work as a deterrent. Use Substances That Repel Skunks There are a few different substances known to be offensive to skunks. If you place them around the edges of your yard and in areas where you suspect skunks like to spend time, the skunks will start avoiding those areas. These repellents have to be reapplied every few days, especially after a heavy rain. • Fox and dog urine deters skunks, since foxes and dogs are skunks' natural predators. Products containing these substances can be purchased at most hardware/home improvement stores. Spray it around the perimeter of your yard. • Pepper sprays, also sold to repel squirrels and other wild creatures, are effective skunk repellents. Spray them on trees and other areas where you've seen skunks. • Ammonia also deters skunks. Soak old rags in ammonia and place them under your deck or porch to keep skunks from coming in. • Citrus peels have natural repellent qualities. Scatter orange or lemon peels around your property and under your deck or porch.